Thank you to everyone who joined this fun event. 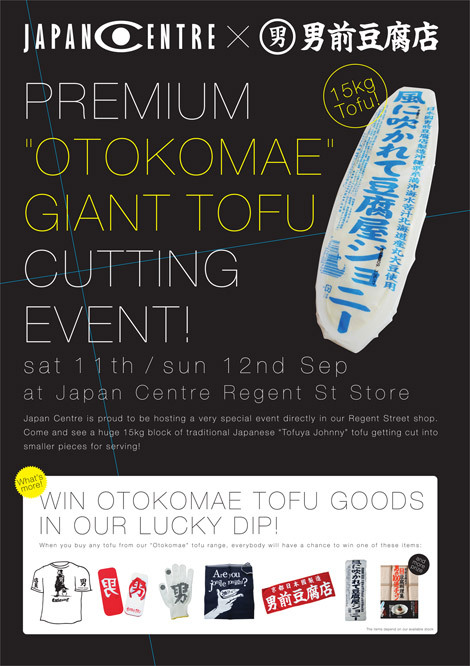 It was a definite success and I hope people had fun and enjoyed the taste of this premium tofu. Check out some of the images from the day! “Otokomae” tofu is one of the most premium brands of tofu in Japan with a variety of different types available. “Tofuya Johnny” is their flagship product which offers a great-tasting, soft and smooth tofu which you can eat as it is with no need to cook. This creamy and sweet tofu can be enjoyed as a healthy snack with toppings such as soy sauce, ponzu citrus sauce, or even as a dessert with honey. Otokomae tofu is handmade using a special process with the highest quality ingredients: nigari (coagulant) from Okinawa, mineral water from Kyoto, 100% soy beans from Hokkaido and NO preservatives. The image says it all, come to Japan Centre this weekend and watch this spectacle! You can even try some free samples of tofu and see that this tasty food can be much more than just a bland meat substitute!